If you&apos;ve ever visited downtown Beaumont, chances are you&apos;ve seen (and taken your photo in front of) the 24-foot, Dalmatian-spotted fire hydrant at the Fire Museum of Texas. We&apos;re often asked, "Is it the World&apos;s Largest Fire Hydrant?" and "What&apos;s it doing in Beaumont?" The giant hydrant was donated to the City of Beaumont by the Walt Disney Company on March 9, 1999 for the re-release of the animated movie "101 Dalmatians." Beaumont was chosen from over 300 museums across the country as the promotion site. Assembled at Disney Land in Anaheim, CA, the hydrant weighs a whopping 4,500 lbs and can blast 1,500 gallons of water a minute. The fire hydrant is constructed of fiber glass and re-enforced with 1,000 feet of steel. Another fun fact: the Dalmatian spots on the hydrant are copyrighted by Walt Disney. Endorsed by the Firemen&apos;s and Fire Marshals&apos; Association of Texas as "The Official Fire Museum of Texas," the museum is an ideal place to permanently house the oversized fire hydrant. The Fire Museum of Texas takes visitors on a journey through the dramatic evolution of firefighting and a history of heroism. Open since 1984, it houses a collection that includes antique horse-drawn and motorized fire equipment and many unusual items used by firefighters of yesteryear. Upstairs, kids enjoy the "Fire Safety Activity Center," which demonstrates 30 fire and home safety facts for families. 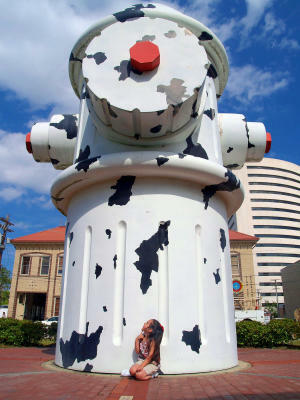 At the time of construction, the Dalmatian-spotted hydrant was the world&apos;s largest fire hydrant. It held the title for two years when a larger hydrant was built in Elm Creek, Manitoba, Canada measuring 29-1/2 feet tall. That hydrant has since been surpassed by the 40 feet tall fire hydrant in Columbia, SC - which holds the official title of world&apos;s largest fire hydrant, for now. So while Beaumont may no longer hold the title of World&apos;s Largest Fire Hydrant, ours does work. So, we&apos;ve revamped the name to World&apos;s Largest [Working] Fire Hydrant. Plan your visit to the fire hydrant & the museum. Fire hydrants started out in the 1880&apos;s where municipal waterworks used hollowed cypress logs filled with water and buried them underground like the modern day piping system. To get the water out, firemen dug down to the log, drilled a hole, and then filled the engines with the water. When they were done, they would use a wooden plug to preserve the rest of the water. This is where the term "fire plug" comes from. There is a portion of the wooden pipe on display in Bay 4 at the Fire Museum of Texas that was installed in Beaumont in 1883. Also on display are several antique fire hydrants. The oldest is a 1908 Darling Valve removed in 1985 from service in Bridgewater, Pennsylvania and donated to the museum by American Valve and Hydrant. Hydrants were originally patented in 1801 by Frederick Graff, a ship captain in Philadelphia, Pennsylvania. Since then, over 89 companies have manufactured hydrants.